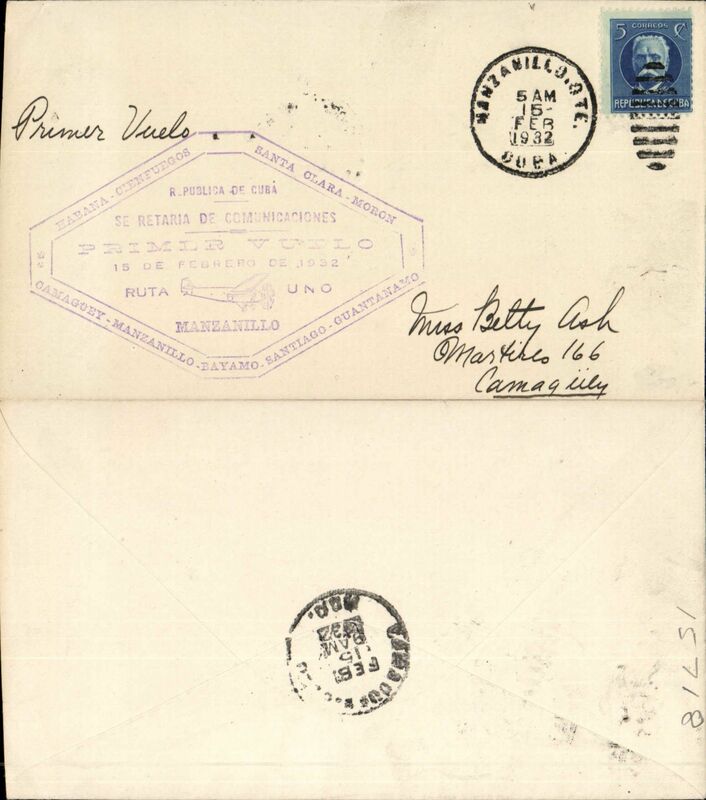 F/F Havana (Cuba) to Key West (USA), purple cachet, bs 19/10, airmail cover franked 2c, violet octagonal flight cachet, Pan Am. 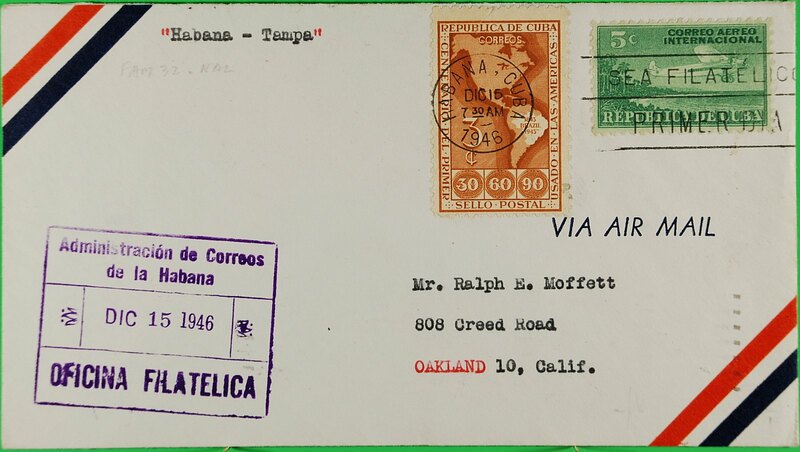 Early airmail from Cuba to England, underpaid commercial notary cover, Havana to Nottingham, endorsed "By Airmail New York" franked 5c, framed hexagonal "T" and "5D/620" postage due markings and with added GB 2d and 3d postage dues. 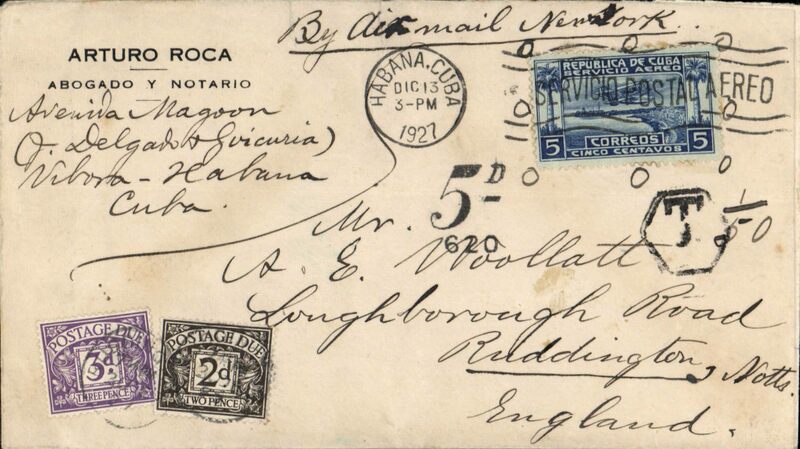 Mixed frank cover flown Havana to Key West, and on to New York, bs 10/2, franked Cuba 1928 air 5c red opt "Lindbergh/Febrero 1928" commemorating Lindbergh's arrival at Havana on that day, canc Havana machine cancel, and US 10c air canc 'Varick Street/D.D./New York' . 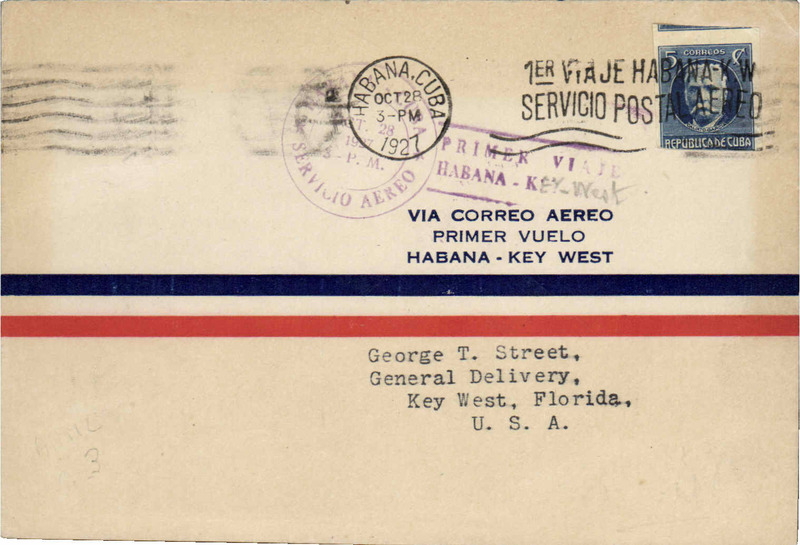 West Indian Aerial Express, F/F Santiago de Cuba to San Juan, franked 1927 5c air canc, black boxed rectangular cachet inscribed "Primer Viaje Aereo/Cuba. 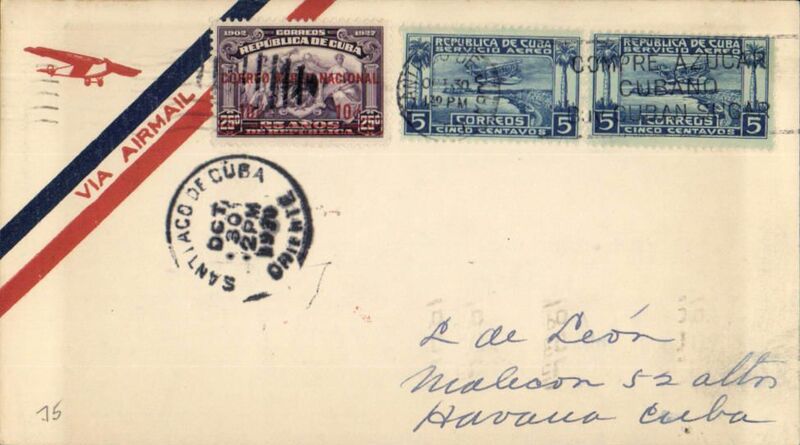 Haiti-Santo Domingo-Pto Rico/Aeroplano Santa Maria", purple cds, b/s, special printed cover signed by pilot B L Rowe. 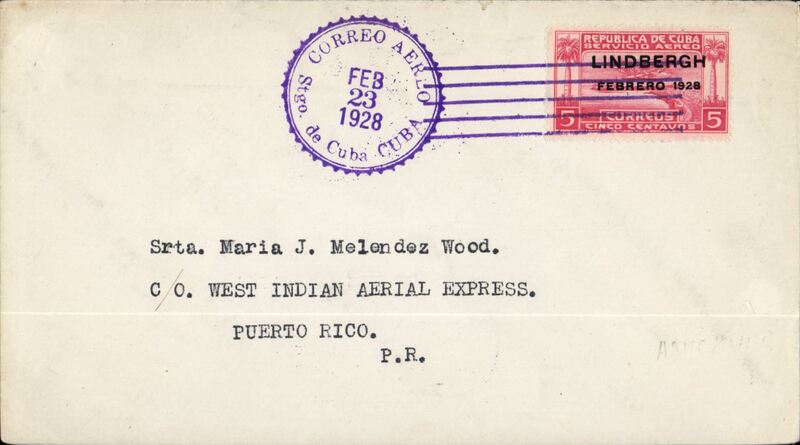 West Indian Aerial Express, F/F Santiago de Cuba to San Juan 26/2 franked 5c o/p Lindbergh Febrero 1928, canc official violet cds, Image. 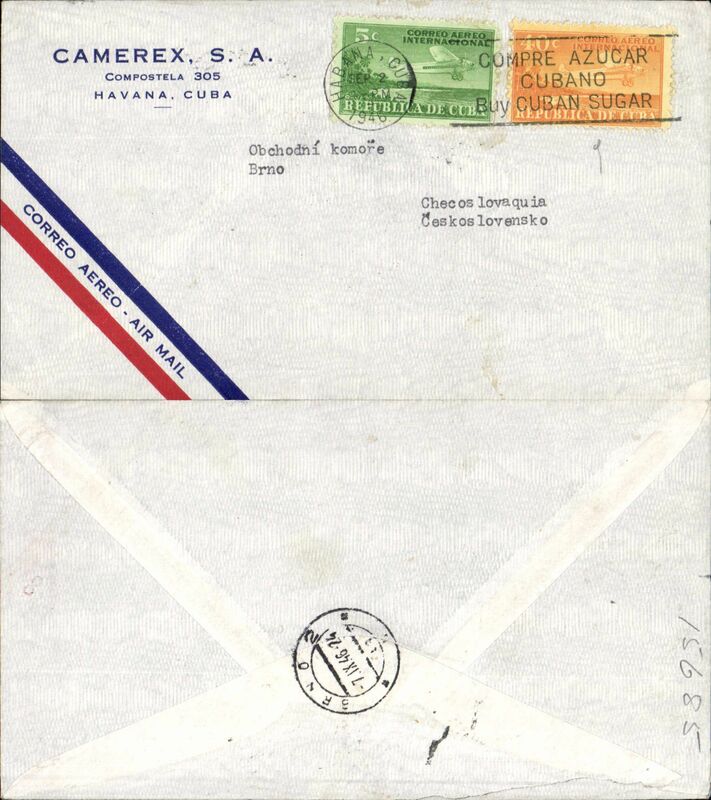 West Indian Aerial Express, F/F Santiago de Cuba to Havana, franked 1927 5c air canc, black boxed rectangular cachet inscribed "Primer Correo Aereo/Santiago De Cuba to Havana", purple cds, Hotel Venus printed cover. 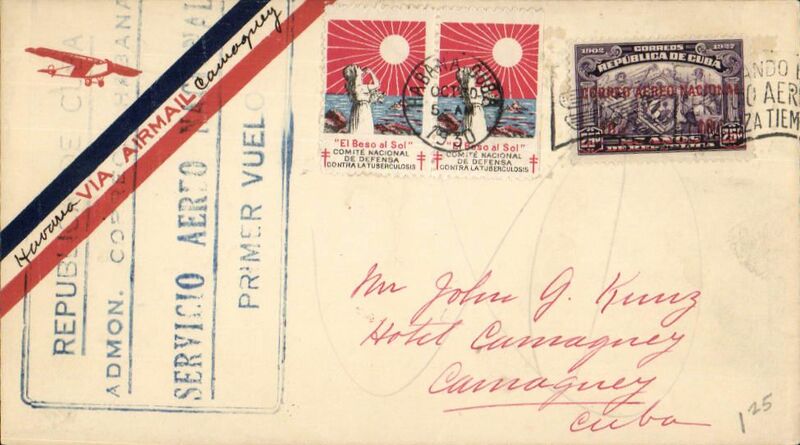 West Indian Aerial Express, F/F Santiago de Cuba to Santa Domingo, franked 1927 5c air canc, black boxed rectangular cachet inscribed "Primer Viaje Aereo/Cuba. 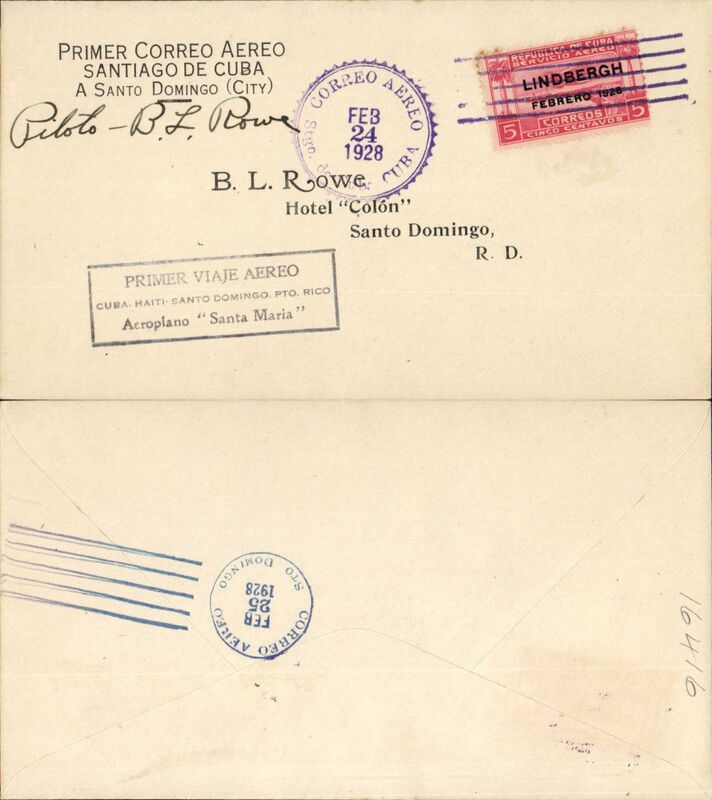 Haiti-Santo Domingo-Pto Rico/Aeroplano Santa Maria", purple cds, b/s, special printed cover signed by pilot B L Rowe. 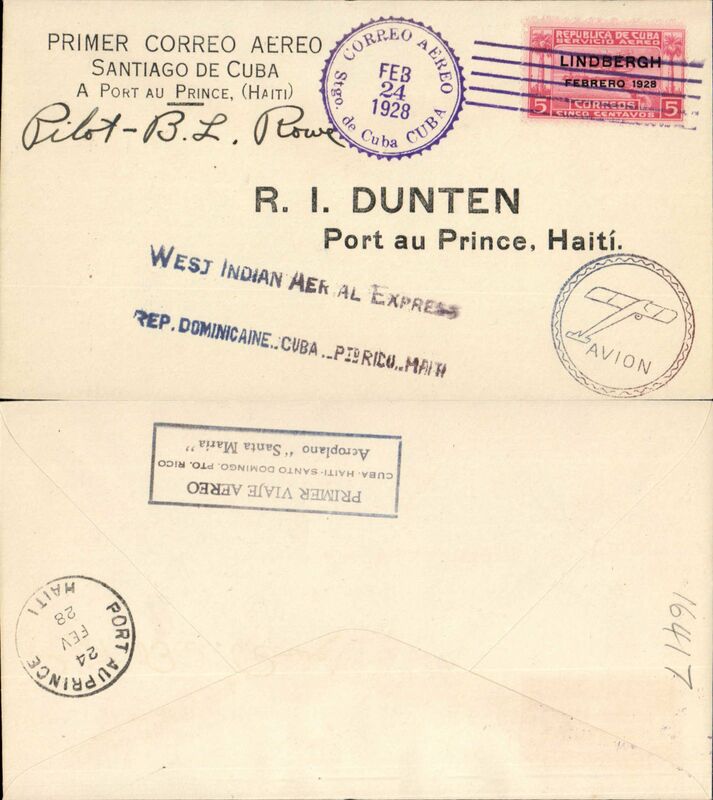 West Indian Aerial Express, F/F Santiago de Cuba to Port au Prince franked 5c o/p Lindbergh Febrero 1928, canc official violet cds, blue straight line 'Western Indian Aerial Express/Rep. Dominicaine ..Cuba. 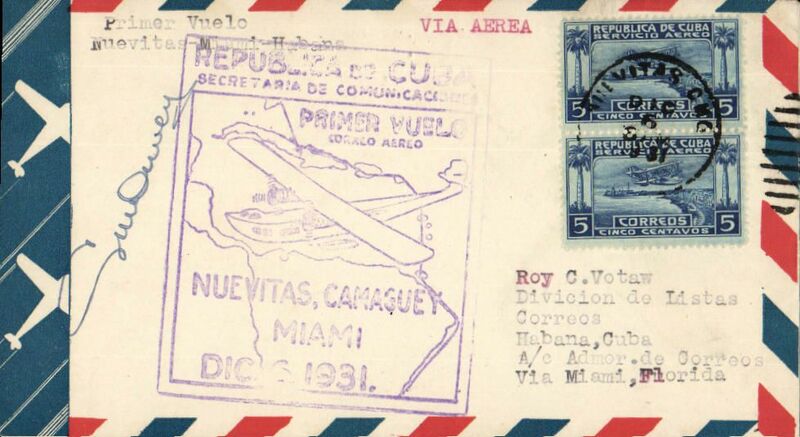 Puerto Rico..Haiti', and monoplane in circle cachets, b/s 24/2, black boxed rectangular cachet inscribed "Primer Viaje Aereo/Cuba. 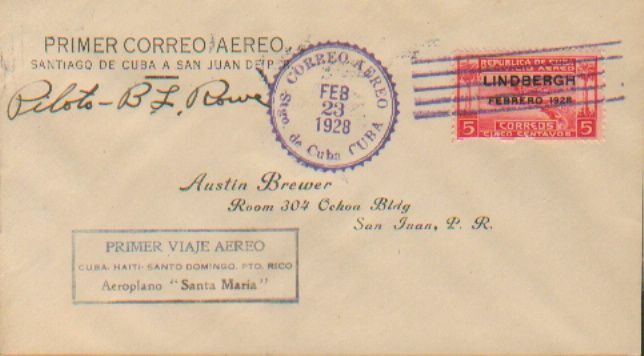 Haiti-Santo Domingo-Pto Rico/Aeroplano Santa Maria" verso, printed special cover signed Basil Rowe pilot. 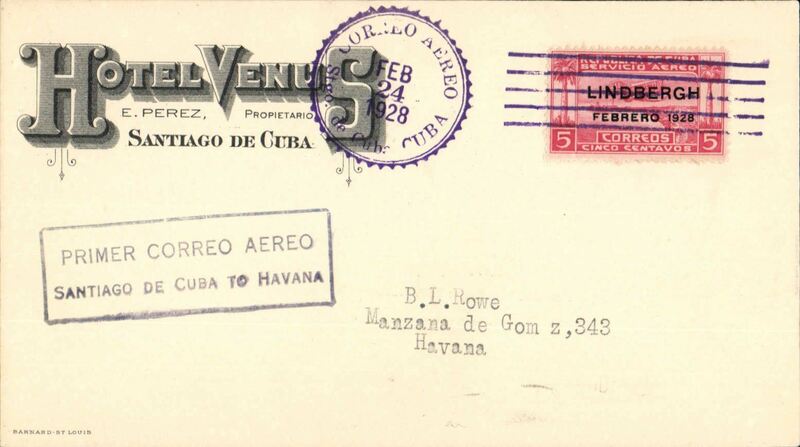 Servicio Aereo Nacional, Moron to Miranda Oriente, bs 31/10, carried on F/F Moron-Santiago de Cuba internal service, airmail cover franked 20c canc Moron/Cuba/30 Oct 1930 cds, typed 'Primer Vuelo/Moron-Santiago', large framed vilet flight cachet verso. Tiny non invasive top edge worm hole. 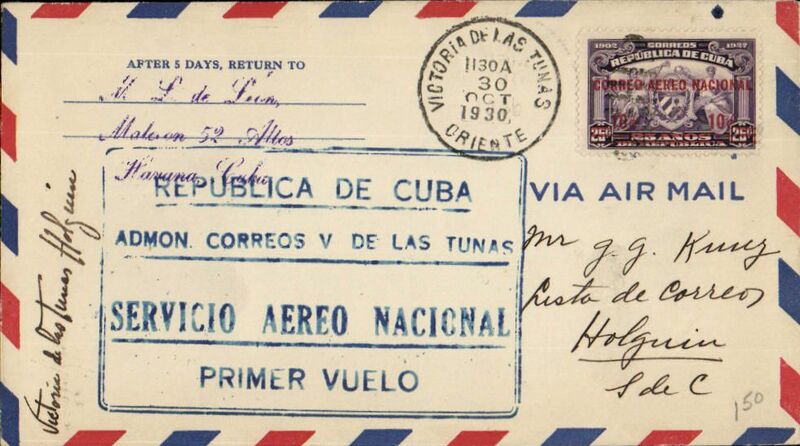 Servicio Aereo Nacional, F/F Route #1, Havana -Camaguey, bs 30/10, airmail cover franked 25c + two Tuberulosis labels, large blue framed cachet. 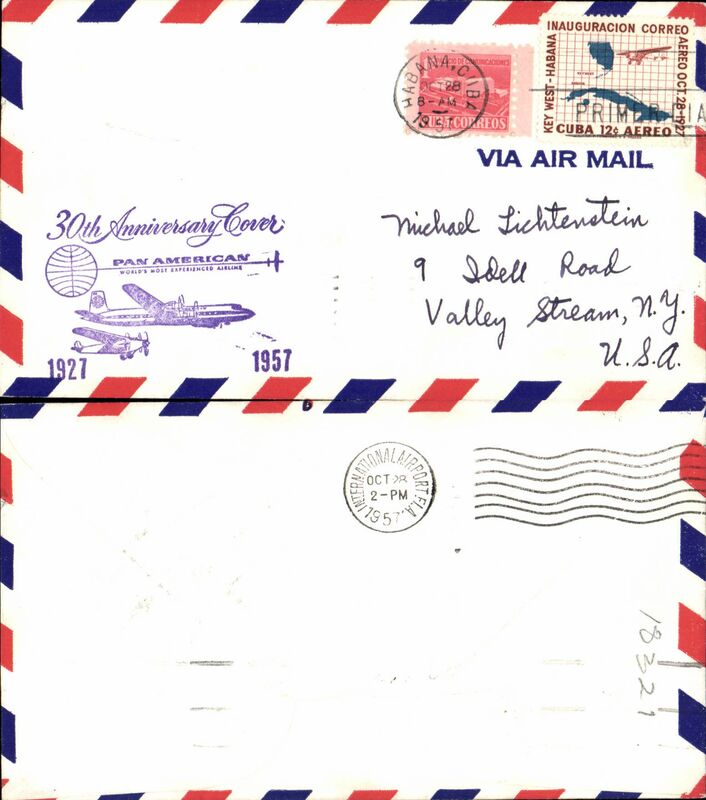 Servicio Aereo Nacional, F/F Route #1, Victoria de Las Tunas to Holguin, bs 30/10, airmail cover franked 25c, large blue framed flight cachet. 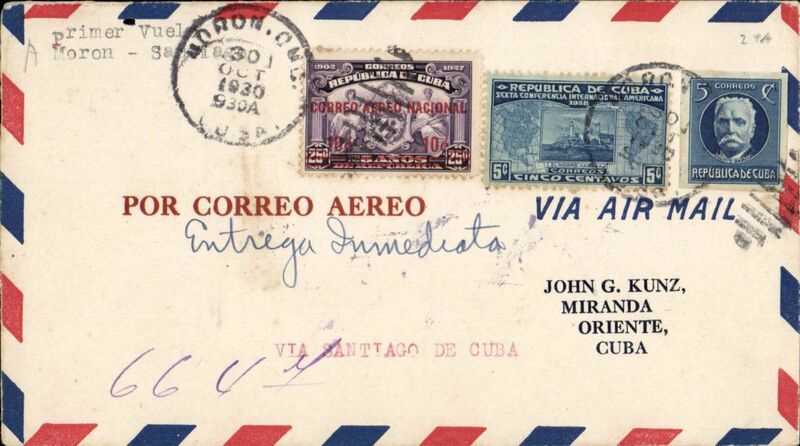 Servicio Aereo Nacional, F/F Route #1, Santiago de Cuba-Havana bs 31/10 airmail cover franked 20c, large blue framed flight cachet. 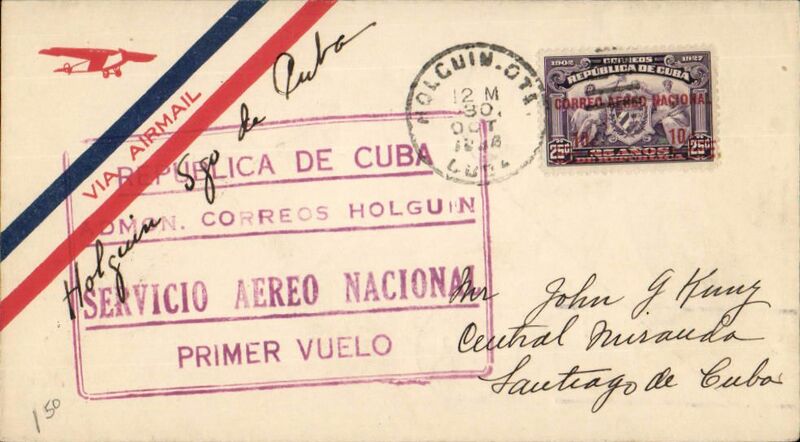 Servicio Aereo Nacional, F/F Route #1, Holguin-Santiago de Cuba, bs 30/10, airmail cover franked 10c, large red framed flight cachet. 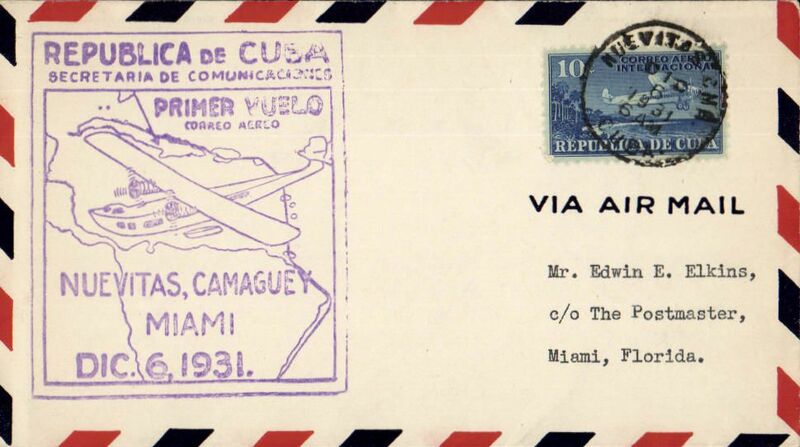 F/F FAM 6, Nuevitas to Miami, airmail cover franked 10c canc Nuevitas cds, and return to Havana 7/12, large purple framed flight cachet, Pan Am. Signed by the pilot C.M.Dewey. 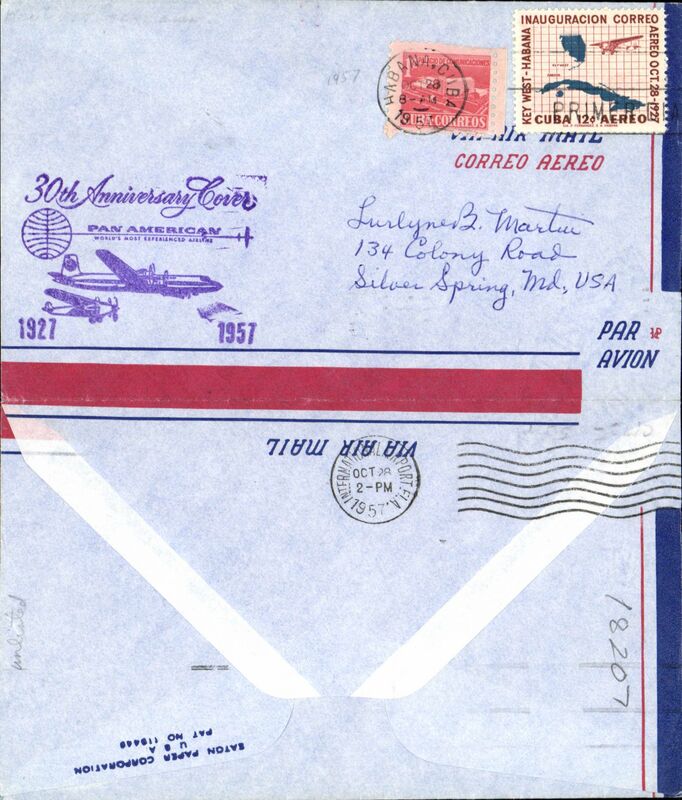 F/F FAM 6, Nuevitas to Miami, no arrival ds, airmail cover franked 10c canc Nuevitas cds, large purple framed flight cachet, Pan Am. F/F, internal route extension, Manzanillo to Camaguey, b/s, ms 'Primer Vuelo', large violet hexagonal flight cachet. 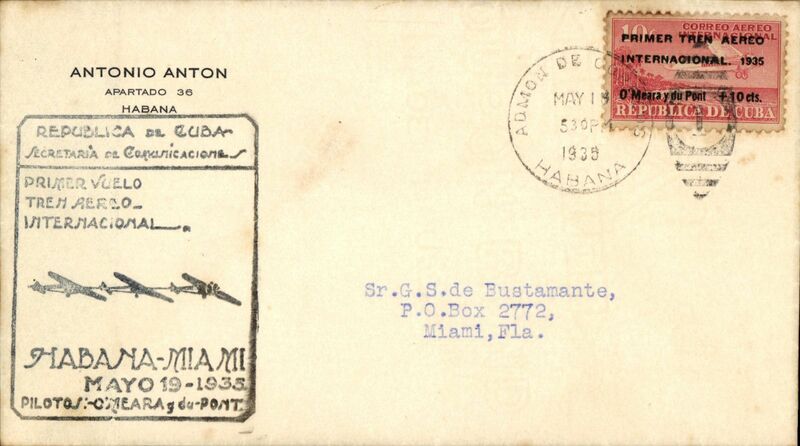 First International Sky Train Overseas Flight, Havana to Miami, no arrival ds, Anton corner cover, franked 10c+10c Sky Train stamp, black special cachet dated May 19. Some perf toning, and gum effusion verso. 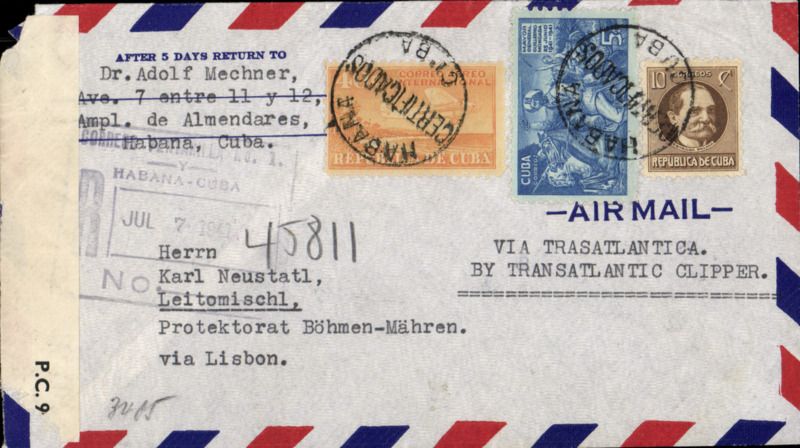 World War II North Atlantic service, dual censored registered cover, Havana to Bohemia-Moravia, via Miami 16/9 and Lisbon, correctly rated 55c, sealed British censor 1608, also brown German censor tape tied by red censor mark. Non invasve top lh corner nibble, otherwise fine. See image. 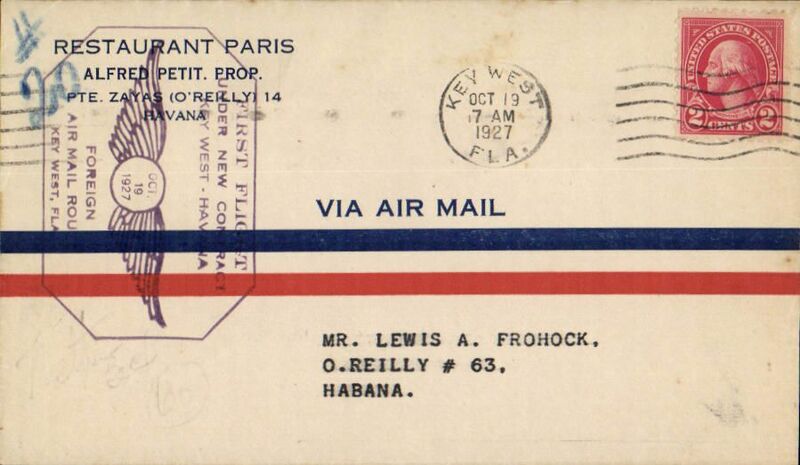 Early post war flown cover, Havana to Brno, Czechoslovakia, bs 7/9, franked 45c, printed commercial airmail cover. Uncommon origin/destination. F/F FAM 31, Havana to New Orleans, bs 1//1, cachet, Chicago and Southern Airlines. Image. F/F Havana to Tampa, cachet, b/s, National AL. 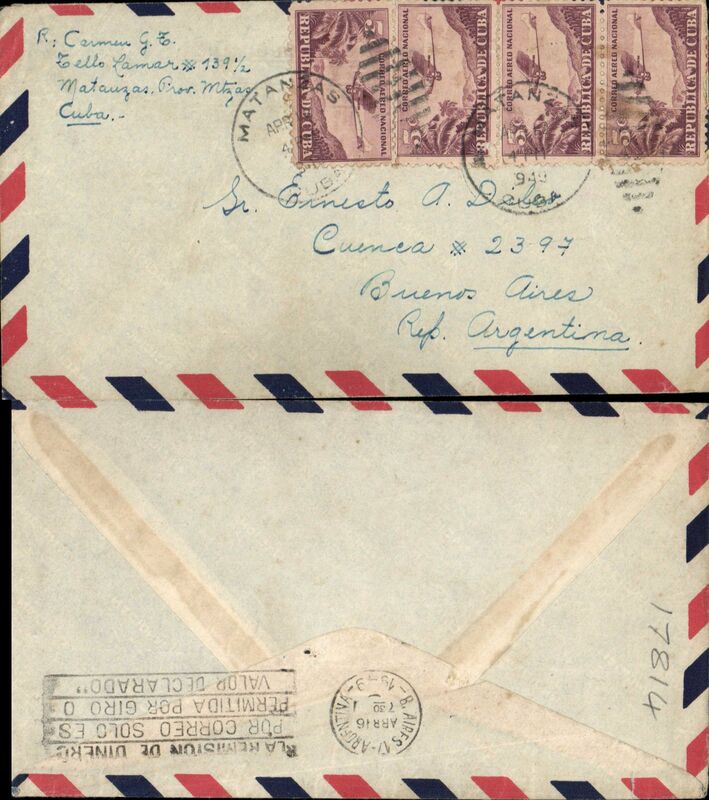 Matanzas to Buenos Aires, bs 16/4, airmail cover franked 15c canc Matanzas cds, uncommon origin. 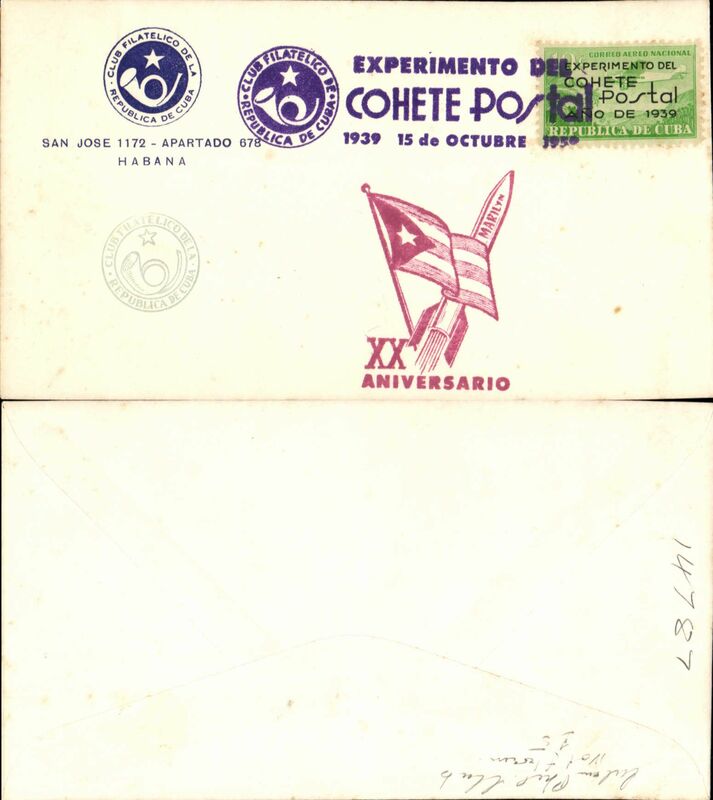 Cuban Philatelic Club, 20th anniversary 1st Cohete Postal Rocket, souvenir cover franked 10c air opt 'Experimento del Cohete Postal Ano de 1939' (the world's first official govt rocket stamp), canc special purple cachet, also pink 'Marilyn' and flag cachet. 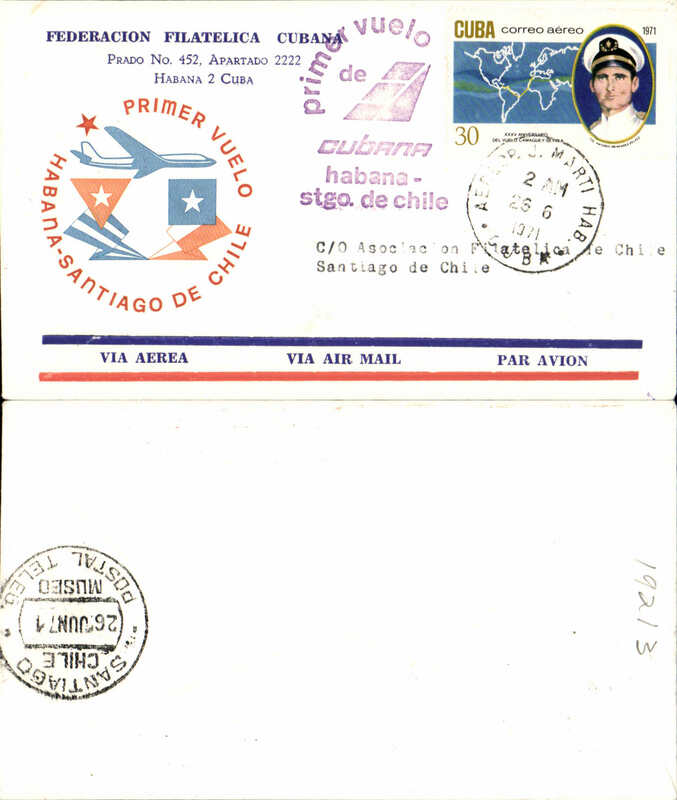 Lan-Chile, F/F Havana to Santiago, b/s 26/6, red flight cachet, souvenir cover. 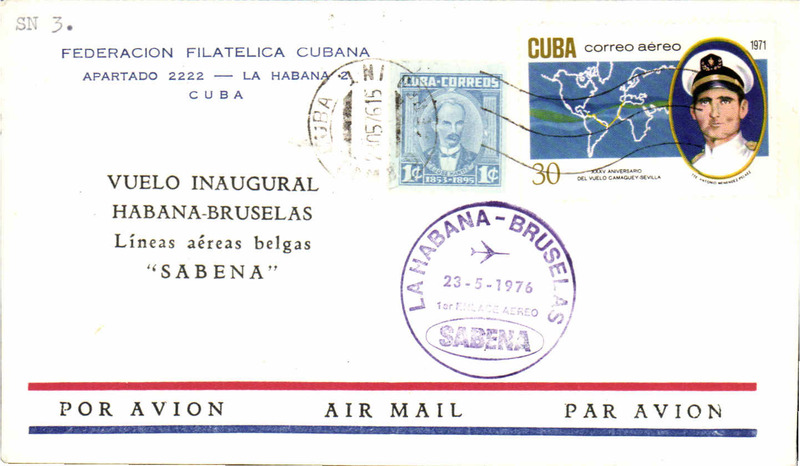 F/F Havana-Brussels, cachet, b/s, souvenir cover, Sabena. 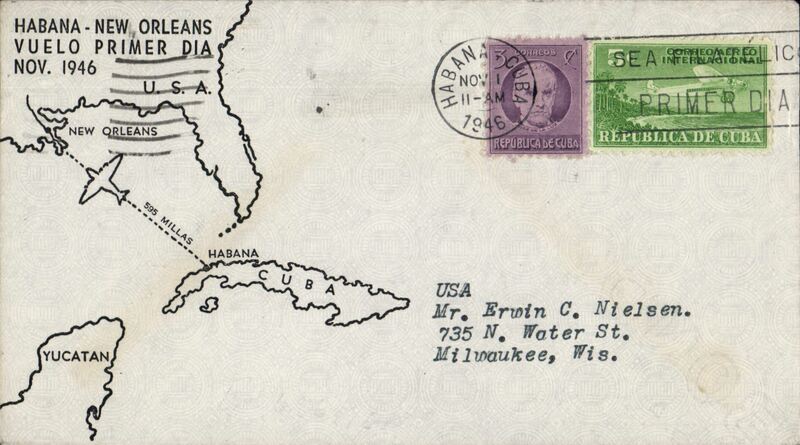 Cubana Airlines Transatlantic Flights set of 6 on two FDC's, Cuba 1988.